As the new year approaches we are setting the wheels in motion to start the Biggest Loser for 2015. Anyone interested in being a leader or part of a team please contact either Bridget O Loughlin on 0872970665 or Anne Fenlon 087 2022714 to put your name on the list. The Harrow cycle group are holding their Annual Fun Cycle Run from Monageer to Wexford and back at 1pm on Bank Holiday Monday 3rd June. 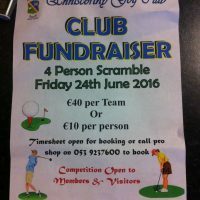 All proceeds to the Cancer Unit at the Children’s Hospital Crumlin. Anyone interested in partaking, please phone Josie Gahan on 087 6642057 for further details. Children must be accompanied by an adult. This is the 11th year of the cycle and over €100,000 has been raised to date.